Direct drive protects the environment and cuts costs. LEITNER ropeways’ globally unique direct drive hasn’t just won over the cableway operators - the innovative gearless technology also succeeds in significantly reducing energy consumption, and can be used as a generator in wind power installations as well. It is more reliable than other systems of a comparable nature, as well as more comfortable for passengers thanks to its lower noise emissions. Given the number of new cableways using direct drive - for example in Kitzbühel (Austria), Winterberg (Germany) and Laax (Switzerland) - LEITNER ropeways has once again underlined its high degree of competence as regards sustainability and environmental responsibility. Environmental factors are taking on an ever bigger role in installations such as cableways and lifts. This is because such systems are usually installed in particularly precious environments that must be protected. 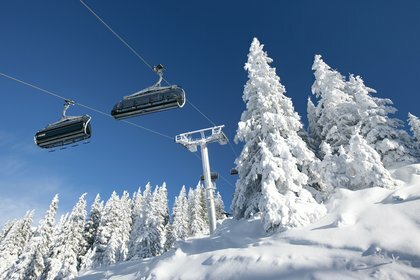 While environmental sustainability and energy consumption are becoming increasing important for cable operators, LEITNER ropeways recognised these particular needs very early on: the cableway manufacturer has maintained a quality management system certified according to the ISO 9001 standard for many years, and has now also integrated an environmental management system certified according to ISO 14001. The company values sustainability very highly, which is reflected in varied fields – from its integrated management systems to its innovative products. The LEITNER direct drive - a gearless drive system for cableways – is unparalleled across the world. It consists of a low-speed synchronous motor, and its output shaft is directly linked to the pulley wheel. The direct drive consists of three moving parts – the rotor and two supports that move with the pulley’s number of revolutions. Foregoing a complex gear system has considerable advantages in terms of its operation: maximum running smoothness thanks to noise emissions reduced by approximately 15 decibels. The loss of efficiency common in normal gear systems can also be avoided by up to five per cent. In practice, this innovation means a convincing competitive edge for the business. Savings can be made on energy costs, while the cableway operators distinguish themselves on site as innovative and environmentally-aware companies. The 8-person chair lift Ochsalm in the ski region of Kitzbühel proves just how much more economical and environmentally-friendly the direct drive really is. 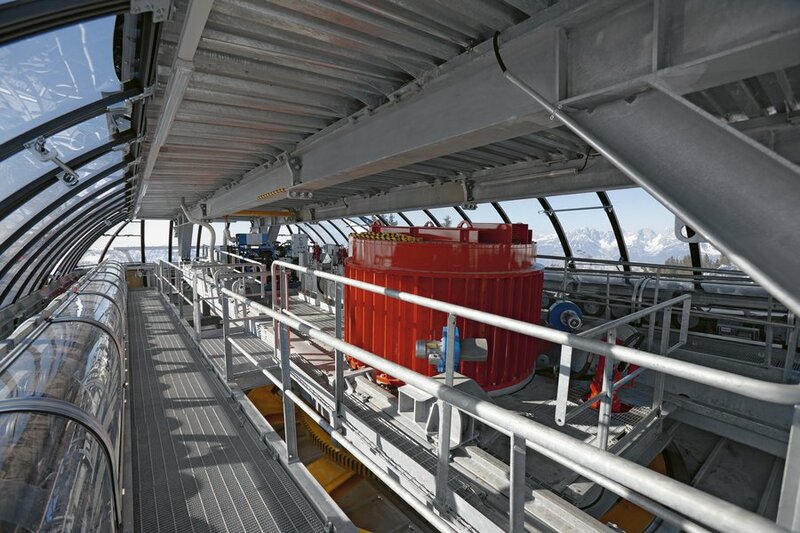 Last winter, the cableways there reduced their energy consumption by five per cent using direct drive. This meant a total season saving of 41,080 kilowatt hours over 125 days and 1,027 hours of operation - that’s 4,108 Euros based on 10 cents per kilowatt hour. With the installation predicted to last 15 years, the operators will thus save more than 61,000 Euros. Using direct drive also means that transmission fluid is not required – another environmentally-friendly advantage. Another of LEITNER’S cableways with direct drive is also enjoying successful use - in Winterberg, in the German region of Sauerland. This new Valley Express at the winter sports arena is the first cableway in Germany to use direct drive. LEITNER’S direct drive has not only proved itself to be an innovative technology in terms of cableways - LEITNER has also laid the technical foundations to create an equally innovative and promising business field with LEITWIND wind power installations. In this case, the drive mechanism would be used in reverse as a generator. High efficiency, maximum reliability and simple maintenance play a key role in these installations - features that match the direct drive system perfectly. The impressive results of such a system can be seen in the small ski region of Salzstiegl in the Swiss region of Styria. “Energy, particularly electricity, has always been our main cost factor and therefore a very important issue for our ski region in terms of lifts, guesthouses and snow-making systems,” comments owner Friedl Kaltenegger on his decision to supplement the LTW77 wind power installation installed in 2007 with its successor, the model LTW80. 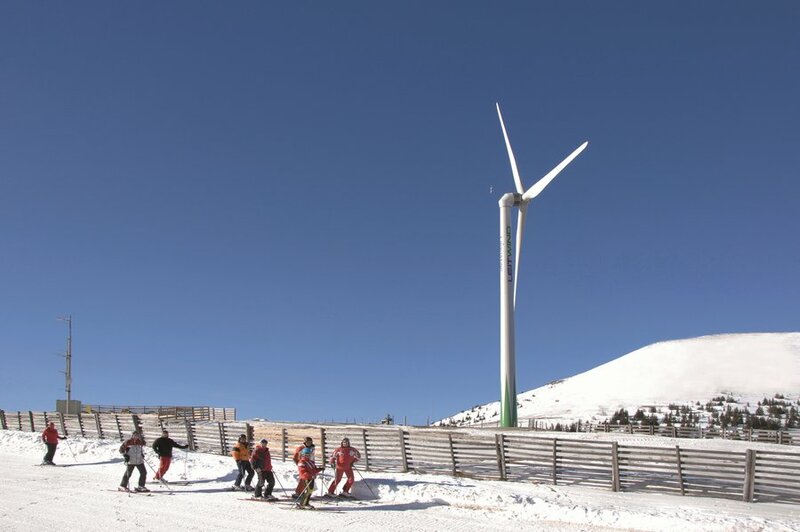 The entire ski region’s electricity demand is covered by the addition of the second installation, saving up to 2.7 million kilowatt hours from the public grid. Kaltenegger based his decision to install a LEITWIND system with direct drive on the reliability of the gear-less generator and LEITWIND’S high level of expertise and experience in this field. Direct drive installations will provide an answer to fundamental questions of the future. In the meantime, the LEITNER Group can look back proudly on its impressive backlist: more than 20 cableways and 180 wind power facilities work using this technology. 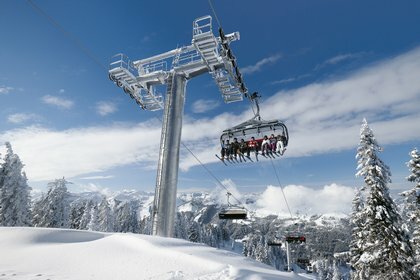 In 2011, new cableways were built in Laax (Switzerland) and Slovakia in addition to those in Kitzbühel (Austria) and Winterberg (Germany). For LEITNER ropeways, this represents a significant competitive edge and, most of all, key advantages for its customers. Installations that are quieter, more reliable and thus more cost-effective will enjoy even greater demand in the future. These kinds of innovative solutions enable LEITNER ropeways to set the perfect framework for the successful implementation of cableways in alternative fields, such as in cities or for tourist attractions.